I put winter patties on some colonies today. The weather was perfect to open a hive. Nice and sunny and no wind. A couple colonies were short of food. I could tell these hives were light on stores by all of the bees in the top box. Right now the bees should still be in the bottom box. In some colonies I could see the bees down deep between the frames, this is fine. That is a sign of ample food stores. But, when the bees are covering the frames in the top box, they need food. I checked some hives today. I wanted to see a few things. I wintered my colonies with Bee Cozy winter covers. It was a sunny day, around 20 degrees. I wanted to see how warm the center strip of the winter cover would be. Touching the strip with my hand, I could feel the whole center strip was very warm to the touch. It would be very easy for the bees to fly out of their top box hole. A couple hives were short on stores. When I looked under the inner cover there were bees all over the top box. Seeing this in late December is a clue that the hive is short of stores. I did add some winter patties to hopefully get them to February. Wendy and I participated in the annual Christmas bird count. You spend the day watching the bird feeders. While there are hundreds of birds that come to our feeders during the day. We count the greatest number at any one time. This gives an idea of general population strength when compared to other years. Plus the number of species that are recorded, to track the population of any one species. There are many bird counters around the metro area and around the entire United States. We report to the northeast metro coordinator. Closed Christmas eve Thursday Dec 24th thru Sunday Dec the 27th. Wendy and I would like to wish everyone Happy Holidays. We're launching a new email newsletter! The newsletter will include information about package bees. If you're already on our email lists, we'll need you to sign up again. Click on the link to sign up. I stopped at a commercial beekeepers last week. His truck here is full of empty single hives. He will bring them to Texas soon. He already has moved several truckloads of live bees to Texas already. This empty equipment will be used for splits. He will start a new colony with a frame of bees and gives them a queen cell. He checks for a laying queen after three weeks of putting in the queen cell. If there is a laying queen that's great. No queen, he puts in a new queen cell. The queen that is laying early may have brood taken from it and moved to the later starting colonies to bolster their population. All the hives will be brought back to MN or SD in early May. Hopefully before the dandelions bloom, so the bees can get the free nectar and he won't have to feed the bees as much. If your counting, and I know you are. I believe there is 800 single hives on this load. They are on pallets. Four hives to a pallet. Right now they have fed the bees twice since moving them to Texas. Pollen patties will go on in January. The whole crew shows up in late January. It is full time work from the first of February until the bees are shipped back here. Feeding, making queens, and splits. Making queens and four frame nucs to sell to his many customers. Besides making up 7000 colonies for his own honey production. Down in east Texas there are beekeepers everywhere. There is a huge market for queen cells and frames of brood. A frame of brood with adhering bees sells for $20.00 a frame. Nature's Nectar LLC does offer many items for Christmas gifts for your favorite beekeeper. Many others products available to fit your budget. This is a good article that explains the phenomena of crystallization. A local beekeeper Dewey Hassig is in the January edition of the American Bee Journal. He wrote a story about doing a bee presentation. 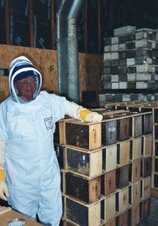 Dewey has kept bees for many years and is an experienced beekeeper. It is nice he is so willing to share his bee knowledge with others. That is a wonderful trait that most beekeepers have, sharing their knowledge. Late fall mite treatment of Oxalic Acid using the dribble method. This works great as a second mite treatment to knock down any re-infestation of mites after the August treatment of Mite Away Quick Strips or ApiGuard. The best time to use it is in late October or early November when there is no brood in the hive. With no brood in the hive, the mites are all on the bees. A treatment of Oxalic Acid by dribble or a vaporizer is a good way to kill these phoretic mites. Not much happening on the bee front right now. The hives should now be covered with winter wraps. The warm weather has made it not essential to do it immediately in early November, but it is good to finish the task before the darkside of winter is upon us. The current temperatures are just perfect for the bees. Too cool for brood rearing but warm enough for minimal consumption of food stores. This will help beekeepers who went into winter a little on the light side of honey stores. The long term outlook for December is warmer than normal, with highs cooling into the 30's. As long as the weather stays warmer than normal, the bees should stay in good condition. Beekeepers that did not treat for Varroa may find a lump of coal in their stocking with a colony that died out early, in spite of this perfect winter weather we are experiencing. If the holiday got away from you and the mite treatment that was planned never happened. There is still nice weather right now for mite treatment. Hopguard and Oxalic Acid would be the two choices to use right now. There should not be any brood in the colonies right now so mites would be very vulnerable riding around on the bees. This warm month of November has been great for the bees. The honey consumption should have been minimal. If this keeps up, beekeepers that wintered light colonies may be able to eek them into late winter. Then I see a feeder pail in their future.